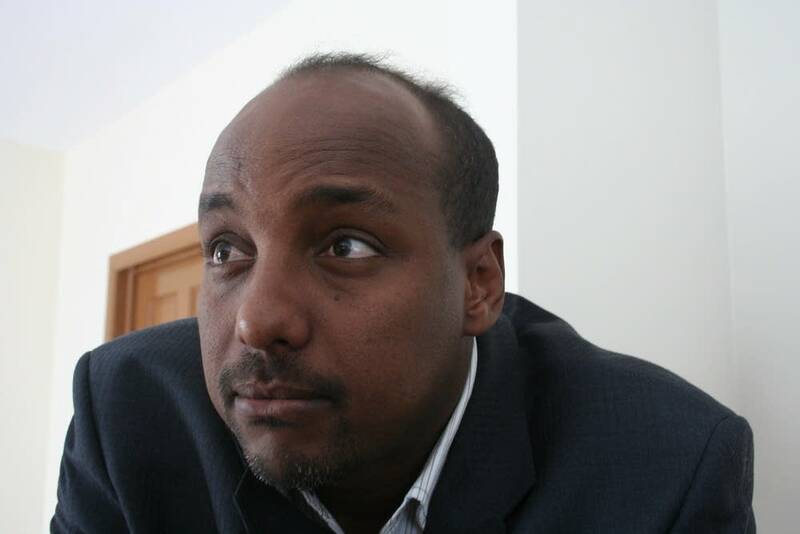 Omar Jamal emerged years ago in Minnesota as the media's most prolific talking head on Somali issues. Recent developments in his homeland have since catapulted him to a world stage. This week on CNN, he was the voice of empathy for the teen-age pirate. "He's a kid. He doesn't know what he's getting into," Jamal told the CNN host. And in the case of the missing Somali-Americans, in which the FBI believes the young men from Minnesota have gone back to Somalia to fight with hard-line Islamists, Jamal has become a mouthpiece for everyone's worst fears. Jamal stands by his comments to the media that the Twin Cities are home to active Al-Qaida cells. He also has been quoted saying that there's nothing preventing the missing Somali-Americans from carrying out suicide bombings in the United States. But these statements are his opinions -- not facts. In between media interviews, Jamal stops by a south Minneapolis house. A sparse living room with a couple desks and computers will be the site of a new legal clinic for his group, the Somali Justice Advocacy Center. As the only paid staffer, Jamal is the center. But he's not a lawyer. Balding with a booming laugh, the father of four is one of the first people reporters call after parachuting into Minneapolis from places like Los Angeles, New York, or even Dubai. "When they call us, we don't say, 'Why do you call us?'" Jamal said. "I'm a Somali person. I'm entitled to speak on Somali issues. Equally, every other Somali individual is entitled. If they choose not to do so, it's not my fault." But his command of the spotlight has infuriated his critics. Many assumed he would be deported -- or at least his star would fade -- after a jury convicted him of lying to immigration officials four years ago. Jamal left Somalia when he was young. On his U.S. asylum application in 1998, Jamal marked "no" when asked if had been granted asylum in any other country, when in fact, he had received the equivalent of permanent status in Canada. Jamal was sentenced to one year of probation. The conviction was supposed to trigger his deportation case. A spokeswoman for the Executive Office for Immigration Review said she could not comment on Jamal's case because there was a "do not disclose" clause on the file. Jamal said the case is pending. "I'm still around," he said. Jamal said he is not allowed to travel to other countries while the case is unresolved. So, he continues to be a watchdog, he said, using the media to keep government in check. "What we have learned is that the feds or the local police force tend to misuse their power in a very dark room," he said. "But when you switch the light on, they behave like humans." His center aims to help poor refugees navigate the legal system. Jamal came under fire this week from Minnesota House Minority Leader Marty Seifert, who said he wants to make sure no taxpayer money goes to groups that support pirates. Jamal said he simply wants to make sure the pirate gets a fair trial. Jamal said his center receives about $80,000 in private donations in a good year. However, he hasn't filed the proper nonprofit paperwork with the IRS, so it's not clear where he gets his money or how he spends it. Most local reporters know that Jamal is controversial. Earlier this year, a group of journalists and Somali community members gathered at the University of Minnesota for a frank discussion about news coverage. A local imam criticized the journalists in the room for constantly turning to a "community leader" who he said was doing more harm than good. Omar Jamal wasn't there, but everyone knew who the imam was talking about. Duchesne Drew, a top editor at the Star Tribune, directly addressed the imam's concerns. "Rather than talking around it, I'll just say it: Yeah, you will see Omar Jamal's name in the paper," he said, prompting laughter from a mostly Somali-American crowd. But Drew also offered an honest explanation for why the media relies so much on Jamal: "Omar returns phone calls." And Jamal sends out press releases every few days. For reporters who lack deep inroads to the community, he's a gatekeeper of information. At a news conference Jamal called earlier this month, he promised to get in touch with a group of Somali pirates who had captured a Nigerian ship. Jamal couldn't reach the pirates, but he gave out their phone number to the gaggle of reporters. Then he reconsidered and made them promise they wouldn't call the number. It's no question that the Somali-American community is divided -- often over clan lines and political differences rooted in their homeland. Jamal sees himself as a lightning rod for those differences. He said he once walked into a Starbucks to grab some coffee when he saw two Somali men fighting each other. "And one guy came up to me and said, 'They're fighting because one is supporting you, and one is against you,'" Jamal recalls, adding that he had to break up the fight himself. There's even a whisper campaign suggesting that the U.S. government is allowing him to stay in the country because he is an informant for the FBI. Jamal strongly denies it. Jamal said people simply don't like the fact that he supports the idea of a secular government in Somalia. And when it comes to the case of the missing men, he got grief for insisting that the leaders of a Minneapolis mosque, Abubakar As-Saddique, radicalized the youth. The mosque directors deny they had had any role in the recruitment. Jamal stands by his comments. "Almost all the mothers I talked to, their kids spent quite a bit of time at the Abubakar mosque," Jamal said. "If they spent that amount of time or spent [nights] at your house, I would probably ask the question, 'What's going on in your house?'" Abubakar leaders acknowledge that many of the missing men worshipped there, but they also note that the mosque is the largest in the Twin Cities and favored by many young Somali-Americans. Young people who attend prayers there say the FBI has asking them about the mosque as part of their investigation into the missing. Given Jamal's differences with the Abubakar leadership, it's surprising that his new legal clinic sits right next door to the mosque. From his window, Jamal can see men in long dress and sandals who filter out of the building after prayer. When asked if it was awkward being so close to the Abubakar mosque, Jamal said it's a bit ironic, but not awkward. It's also ironic that Jamal himself had early ties to radical Islam. When he was teenager living in Toronto, he studied under a spiritual leader affiliated with the Al Ittihad Al-Islami, a Somali extremist group that peaked in the 1990s. Jamal says he parted ways because the imam discouraged questioning. As a child in Mogadishu, Jamal even marched down to an office of the Palestinian Liberation Organization, hoping to enlist. He said he remembers feeling hopeless and disillusioned, making him vulnerable to radicalization. "It rings the same tone with the kids being indoctrinated here," he said, referring to the young Americans believed to be fighting in Somalia with the extremist group Al-Shabaab. While Jamal is eager to highlight the Minneapolis Somali community's problems, Somali insiders say he doesn't stick around to solve them. 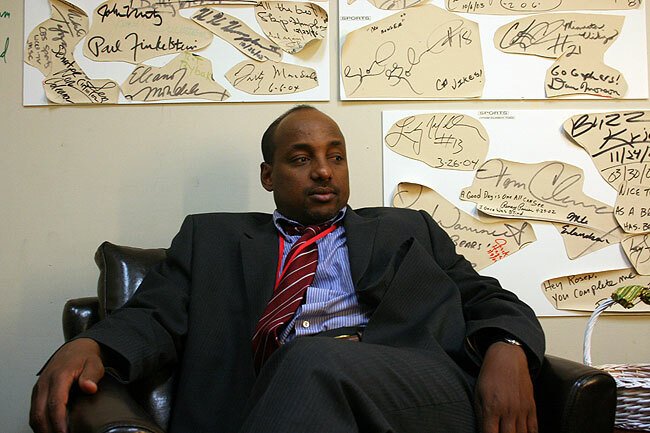 Abdi-Q Ahmed is an Americorps volunteer who teaches leadership skills to at-risk youth. He looks up to some movers and shakers in his community, but Omar Jamal is not one of them. "I never met you. And I really don't know who you are. But I always see you on TV. What are you actually doing about it in the community? Show me what you're doing, and then I'll come talk to you." Yet Ahmed may be too young to remember that Omar Jamal spoke up for Somali-Americans and other Muslims following the Sept. 11 terrorist attacks. Jamal's combination of English skills and impeccable news instincts made him a star. 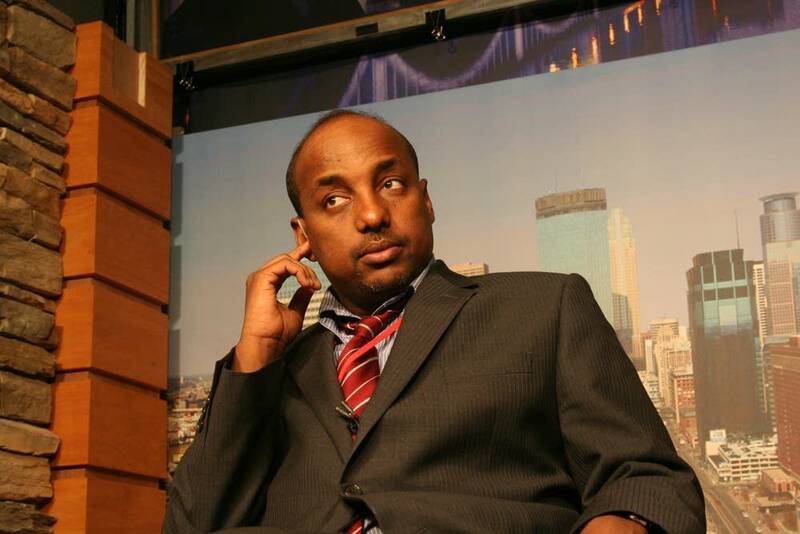 "Here you had a young dynamic person who was on the rise and was seen by the community as someone who could indeed speak for them," said Somali-born journalist Abdi Aynte, who covered the Twin Cities Somali community while working for the news site now known as the Minnesota Independent. Aynte, now a reporter for the BBC in Washington D.C., said Jamal's credibility took a turn in 2002. That's when Minneapolis police fatally shot a mentally ill Somali man who was carrying a machete down Franklin Avenue. Jamal called the city "a slaughterhouse for immigrants." Aynte recalls that many Somali-Americans, who found Minnesota to be a welcoming place, were horrified. "They saw this as an unfortunate incident," Aynte said of the police shooting. "So to stretch it and call the city a slaughterhouse for immigrants, it caused people to step back from [Jamal]." And then there were clues that Jamal was not as close to a given situation as he would claim. Attorney Kevin Magnuson encountered Jamal while representing Keyse Jama, a Somali immigrant who was deported to his homeland -- and then returned to the U.S. after officials there rejected him. Omar Jamal became a spokesman for the jailed Jama, holding press conferences and rallies in support of his release. Keyse Jama's lawyers wanted Jamal to pipe down. "We wanted to try the case in court," Magnuson said. "We didn't want to create a lot of media attention. And that was the exact opposite of Jamal's intentions. I think he saw this case as an opportunity to insert himself into the spotlight." Magnuson said his client had to tell Omar Jamal to stop speaking on his behalf because it was hurting his case. On a Friday evening, Jamal settles into a hookah bar at a Columbia Heights strip mall. He orders the apple flavor and smokes it in a water pipe. "I come here to get relief from day work stress," he said, "and to forget my name." Jamal is quiet for once. He cradles the stem close to his chest as smoke drifts out of his nostrils. He's more reflective. It seems exhausting to be Omar Jamal. "I can't solve the world's problems by myself. I learned that a long time ago," he says. Here at this corner table, Jamal seems as anonymous as he can be, until his cell phone rings again. There are few relationships on the planet these days worse than the one between the Somali community in the Twin Cities and news organizations which don't know how to cover it.